The Laurell EDC-650-8B Spin Processor is compact and packed with advanced features. This 650-series EDC system will accommodate up to ø200mm wafers and 7" × 7" (178mm × 178mm) substrates. Though this system has a 12,000 RPM capability with vacuum hold-down, it is recommended for only 3,000 RPM and non-vacuum chucks. Note: the system's exhaust is also monitored by the process controller and must always remain sufficiently within range to run. Liners: Removable, reusable process chamber liners, made from FEP Teflon®, are available for every Spin Coater model. Back Side Rinse (BSR): An adjustable injector can dispense material on the bottom side of the substrate simultaneously with top side. This technique is most commonly used with DI water to limit back side damage during etching. Rinse to Resistivity: Detects rinse completion and alerts the processor to dry the substrate, saving valuable resources usually wasted on a time-based system. Level Detection: Either in a drain reservoir or supply container. Leak Detection: Laurell uses the most dependable sensor technology availableaudio and video alarm with industry-standard light tree. 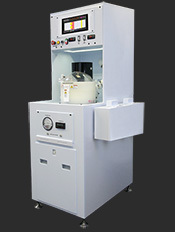 Heated Process Chemistry: with point-of-use or recirculation type heat exchanges. Dual Containment Plumbing: For an extra layer of safety, when heated or dangerous materials are dispensed, Laurell always recommends the use of double-walled plumbing. Installed in a Station: See: Standard Station WS-1000 and Mini Station WS-1000M. Process Controller: The 650-series process controller utilizes a robust microprocessor and with the use of its accompanying PC software (written in an object-oriented programming language) it achieves nearly unheard of flexibility both in process definition and use. This controller allows operator interaction in real-time during the process execution including pausing time, stopping and continuing on from that point. The system can and will be continually updated easily and quickly in the field with downloadable firmware revisions. (we plan ahead at Laurell!) Researchers worldwide have developed unique processes which will ONLY run with the level of control sophistication we offer. The 650-series controller can also be used in conjunction with a PC with Spin 3000, Laurell's exclusive process management software, however this is NOT required to program or run the equipment. The use of a PC adds the ability to record a process as it's run, operate remotely, program or communicate across a LAN or the Internet. The software, which is supplied at no additional cost, allows the operator to create virtual process simulations even beyond the capabilities of the hardware-installed spin processor, in effect letting them try it before they commit to a process. All 650 systems can be upgraded or re-purposed without return to the factory with simple plug-in modules, either actually or virtually, and can contain a near-unlimited number of processes and steps. A Brief Description: The housing for this system is typically made from a solid co-polymer blend exclusive to Laurell Technologies. Unlike pure Natural Polypropylene, this material is able to resist solvents and strong acids and bases. Samples are available for testing and verification upon request. A solid PTFE Hostaflon® TFM-1600 / Teflon® AF housing is available (popular for high-temperature chemistry and sub-micron particle studies). 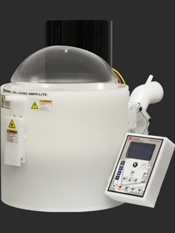 Laurell's unique internal bowl-shaped chamber with its bottom gutter and clear dome lid controls the flow of liquids and gases efficiently from dispense point to drain. A proprietary labyrinth seal protects the motor and control electronics from chemical contamination. This seal provides the process chamber with Nitrogen purge and has been proven to be particle-free on a sub-micron level during field testing. The systems clear top is made from ECTFE (unless otherwise stated) and only ECTFE-coated 316 stainless steel screws are used in some non-wetted areas throughout the system. Need more details? See EDC 650 Series. Includes, but not limited to, Etch, Develop, Clean, typically followed by solvent or aqueous rinse, then dry. "The spin processor is working very well and we are very satisfied." "We are very satisfied with both the use of instrument [sic] and the service & support provided." "We have been using the spin coater now, and Laurell quality is as expected!" "Just wanted to let you know that the new lid assembly we purchased from you is now installed and working beautifully. Many thanks to you and your staff for all the help you gave." "Everything is working fine with the spin processor. The website is also very good for manuals and tutorials." "We are very pleased with it! It is a vast improvement on our previous machine and perfect for our needs." "I look forward to working with you again in the future."